What Is Double Vision / Diplopia? Double vision, also called diplopia, is seeing two images of the same object. Diplopia can be monocular, meaning it occurs in one eye. The double vision continues even if the other eye is covered or you look in another direction. Binocular diplopia occurs when both eyes are open and is caused by a misalignment of the eyes, and disappears when one eye is covered. Many things can cause monocular diplopia including astigmatism, a cataract , keratoconus, pterygium, a growth or swelling in the eyelid, as well as certain retinal disorders. In some cases, such as patients with macular degeneration, the cause of the monocular double vision may constitute an urgent ocular event. Binocular diplopia is sometimes caused by strabismus, a type of misalignment common in children. It can also be caused by other eye muscle disorders and related conditions, including myasthenia gravis, Grave’s disease, and multiple sclerosis (MS). Eye nerve disorders such as cranial nerve palsies, as well as brain conditions, including tumors, aneurysms, infection and traumatic injury, can also result in binocular double vision. 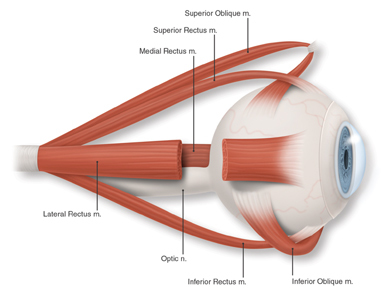 Your eye contains six muscles that receive signals from cranial nerves at the base of your brain. These nerves receive their blood supply from the basilar artery in the brain and from the carotid artery. If the blood supply is disrupted, the movement of certain eye muscles will be affected, resulting in differing symptoms of double vision (vertical double vision, horizontal double vision, misalignment of images, etc. ), depending on which muscles are impacted. This is known as cranial nerve palsy. The major symptom of cranial nerve palsy is the inability to move your eye in one or more directions. This disorder is more common in patients with diabetes. In most cases, the double vision associated with cranial nerve palsy will resolve itself without treatment within three months. Diplopia or double vision should never be ignored. If your double vision is recent and of sudden onset, you should call your eye doctor as soon as possible, particularly if you have a history of macular degeneration. We recommend that you see your eye doctor within 48 hours for any sudden onset diplopia, whether it is monocular or binocular. Your eye doctor will also carefully evaluate the ability to move your eyes in all directions. Inability to move your eyes in one or more directions could be an indication of a nerve palsy. If these tests determine that a neurological problem may be the basis of your double vision, further testing including an MRI and / or CT scan may be necessary. You will also be referred to our specialist in neuro-ophthalmology for evaluation and treatment. The treatment of your double vision will depend on its root cause. If double vision is caused by macular degeneration, therapeutic injections or laser treatment may be recommended. If it is caused by a cataract, surgical removal of the cataract can be considered. Refractive errors can be corrected with glasses in most cases. If the double vision is caused by cranial nerve palsy, it may resolve itself over several months without treatment. In some cases, prisms applied to eye glasses or patching the eye may also help, depending upon which nerve is involved. During this period, periodic follow up visits with your doctor may be required to monitor your vision. Double vision can be a complex medical and neurological problem. Sudden onset diplopia should never be ignored. After a thorough series of tests to determine the root cause of your double vision, your doctor will discuss his findings with you, along with treatment options.